The following news story illustrates this scheme perfectly. Nature Conservancy and other organizations like it are not in the business of conservation at all, but are rather aggressive real estate brokers for the federal government. 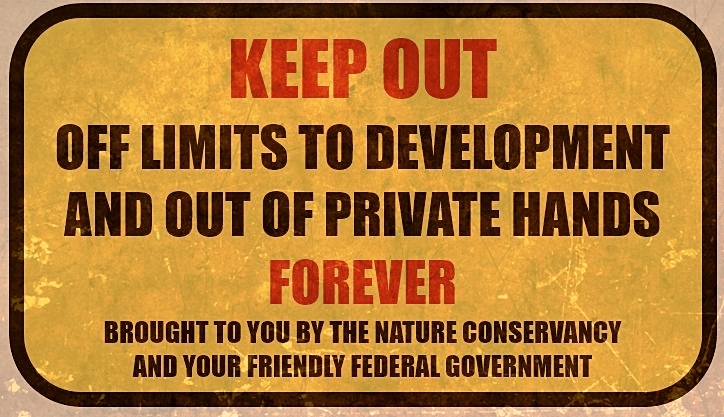 The Nature Conservancy is just one of a number of organizations which use individual and corporate donations, as well as government grants, to buy up private land holdings, and place them into ‘conservation trusts,’ effectively preventing development and free market trade forever. The Nature Conservancy is one of the most feared environmental groups throughout rural America … While promoting itself as a ‘private’ conservation group, small landowners, family farmers, ranchers and tree farmers know it as a strong-arm real estate agent for the federal government. It acquires land at fire-sale prices from landowners bankrupted by environmental regulations, then turns around and sells most of it to the federal government at inflated prices. The last thing America needs is more range and forest land for the federal government to mismanage and burn down. This environmentalist ‘Ponzi’ scheme is often lauded by the and Environmentalist Left and the unknowing public as a ‘free market’ approach to land and resource conservation. The truth is, these schemes are incestuous arrangements wherein global environmentalist groups, primarily funded by grants, donations and confiscatory real estate deals, take property OUT of the free market, and then sell that property to the federal government where, under the guise of protection, it is taken forever out of private hands. CAREY — Nearly 9,000 acres of prime sage grouse habitat in Blaine County is for sale at a discounted price. The Nature Conservancy is selling the Cenarrusa Ranch, once part of the family’s sheep empire northeast of Carey, between the Pioneer Mountains and the Craters of the Moon National Monument. The Cenarrusa name is well known in Idaho. Pete Cenarrusa, Idaho Secretary of State for more than three decades, owned land adjacent to the Cenarrusa ranch. The ranch was previously owned by the politician’s nephew Jim Cenarrusa. The younger Cenarrusa sold the property earlier this year to The Nature Conservancy, so that the ranch — covered with sagebrush, native grasses, fish-filled creeks and wildlife — could be protected from future development. Sage grouse and pronghorn inhabit the region, and that’s created increased efforts from multiple conservation agencies. The Pioneers Alliance, a coalition of conservationists (including the Conservancy), scientists, residents, ranchers and elected officials, began the efforts to conserve ranches in the area. The Cenarrusa Ranch is one of the largest of those ranches. Tess O’Sullivan was part of the group that studied the pronghorn migration corridor north of Craters, as the fleet-footed mammals were “riding the green wave” of grass revealed as snow retreated into higher elevations. Pronghorn migrate through the Cenarrusa Ranch on their way to and from winter feeding grounds. O’Sullivan now works for The Nature Conservancy as a species protection specialist. The purchase of the ranch was a little out of the norm for the Conservancy, she said. Most efforts taken by the group involve helping landowners conserve their own property by placing restrictions on their land. The restrictions, or conservation easements, lower the monetary value of the land and reduce property taxes, while making the property eligible for conservation money through the Department of Agriculture’s Natural Resources Conservation Service and other conservation entities. Landowners give up certain rights to their property to protect the habitat from development, O’Sullivan said. One such conservation easement would allow public access to the land for hunting, fishing and hiking. Another would restrict grazing in wetland areas. Still another would require wildlife-friendly fencing to control cattle. The conservation easements, which are voluntary and legally binding, stay with the property from owner to owner. The Nature Conservancy purchased the ranch with the intention of reselling it to a buyer willing to accept restrictions on its use in exchange for a lower, more affordable price, O’Sullivan said. The price the organization gets from the resale of the land will depend on what conservation easements are negotiated in the sale.